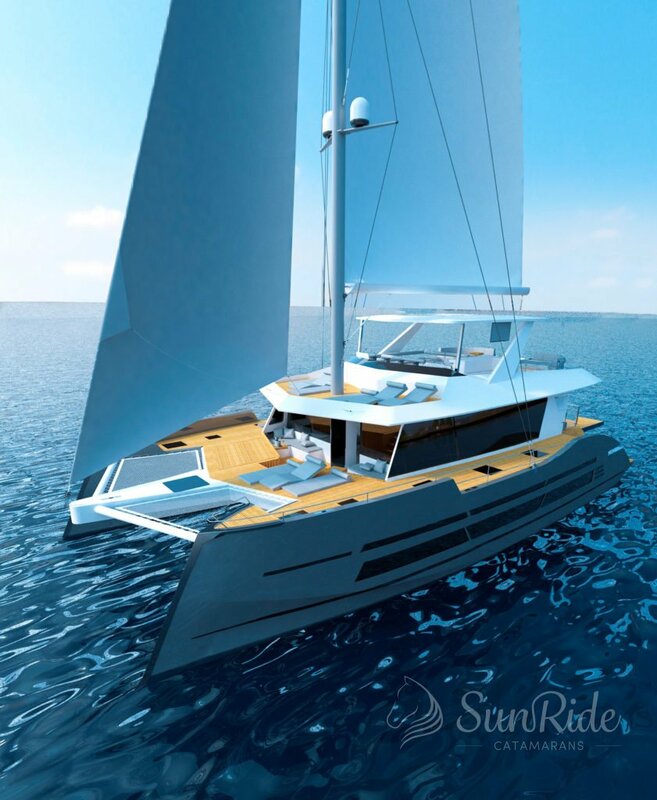 SunRide is designing a new cruise catamaran style in which a reinforced and broaden Flybridge leaves space for the different outside elements that bring relax and well-being to its passengers, as a complete living-dining room, bar counter with grill and dumbwaiter connected to the main kitchen by elevator, big 5/6 people Jacuzzi, 2 independent solarium zones, navigation stall with carbon rudder wheel and the newest electronic technology for a safe sailing. 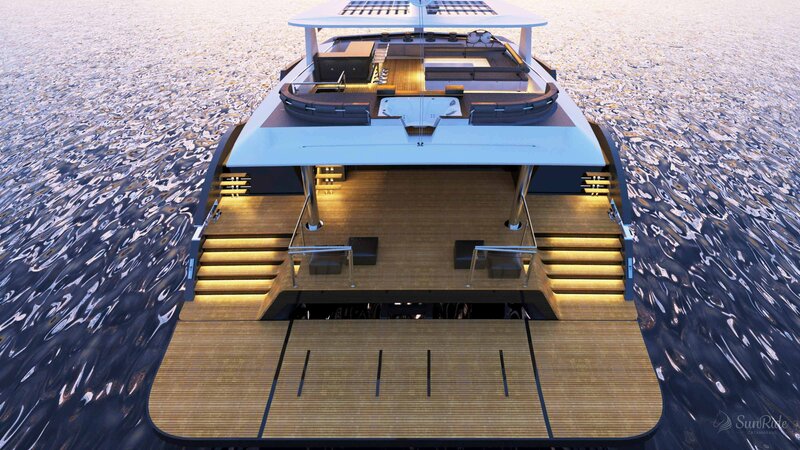 Large stairs with regular steps grant access on the stern side to the Flybridge made with a rigid roof covered on half by Glass-Line solar panels equipped with a UHD television inside and a big cinema screen with surround sound. 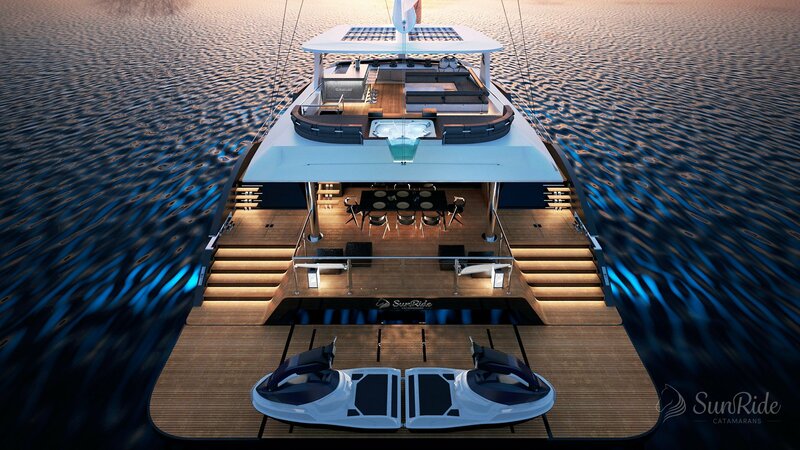 With a 55m2 Main Deck, there is no other catamaran of that length capable of bringing those inside dimensions. 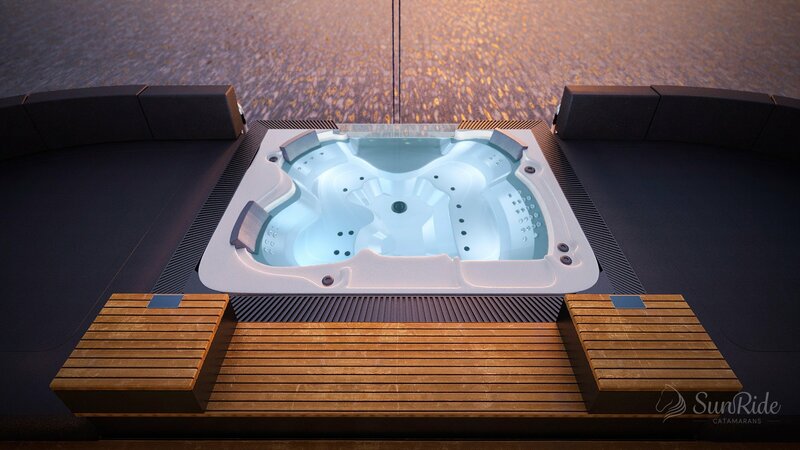 The big space is obtained thanks to the innovative design of its lines and its refined style. 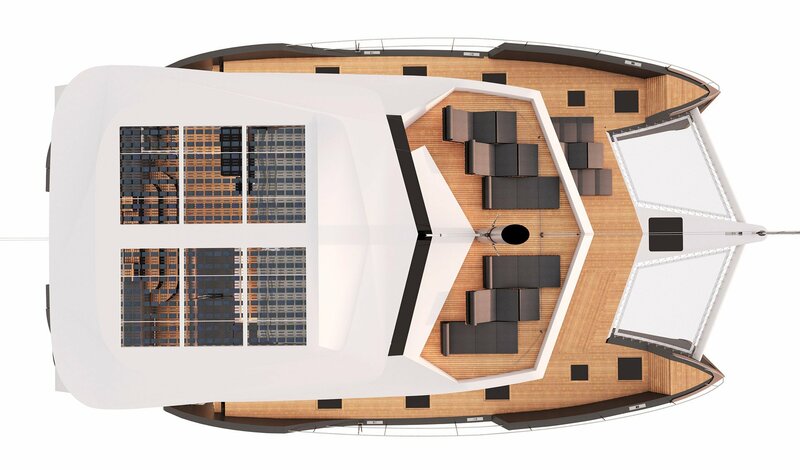 Accessing from the spectacular stern balcony, a large 4-panels sliding door entirely lifted gives access to the big main cabin which is entirely bio-acclimatized digitally and contributes to creating the ideal atmosphere and enjoy the nicest warm evenings. 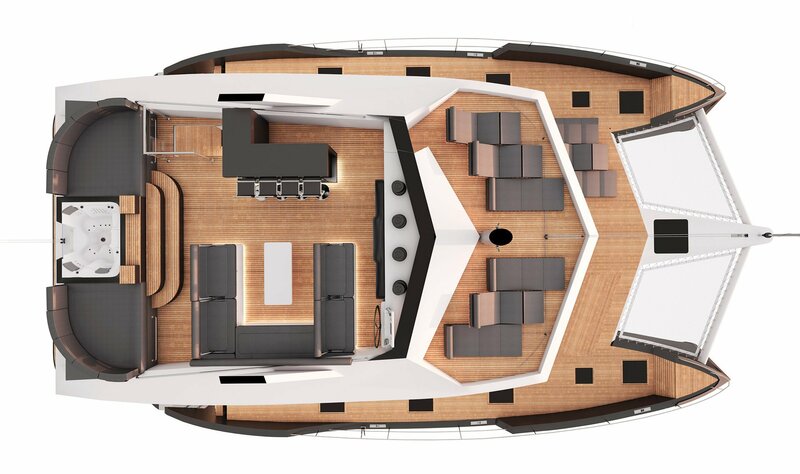 The Visio-Cristal floor opens up to 4 different spaces that will delight the passengers. 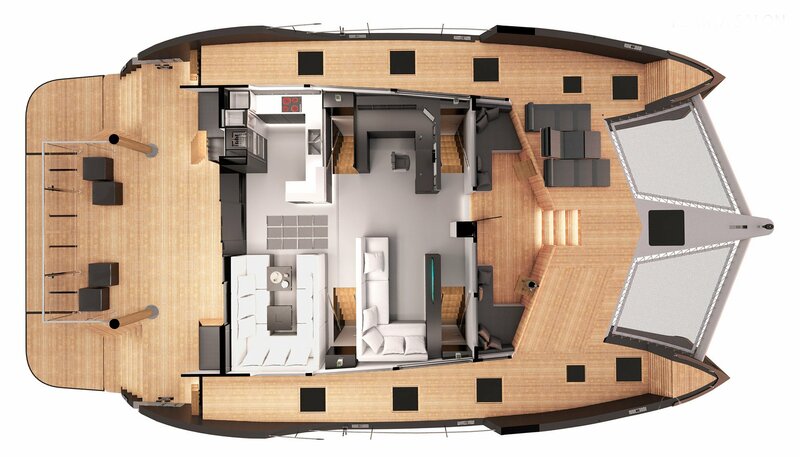 In the entrance to starboard, a large dining room with retractable tables and on the port side an elegant complete kitchen. 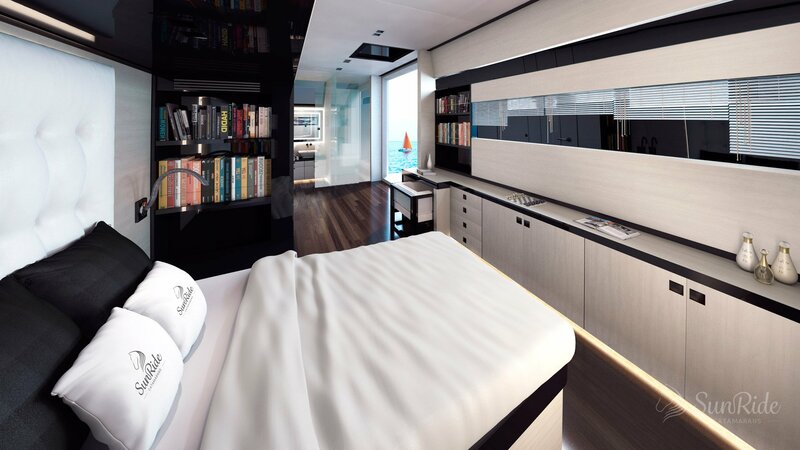 A little bit further to prow stands an independent living room designed as a relax space with comfy massage-integrated sofas, a fridge and a chaise longue that can turn into a bed. Up front stands a large UHD television screen connected to the newest technology of Dolby Surround 7.1 sound. 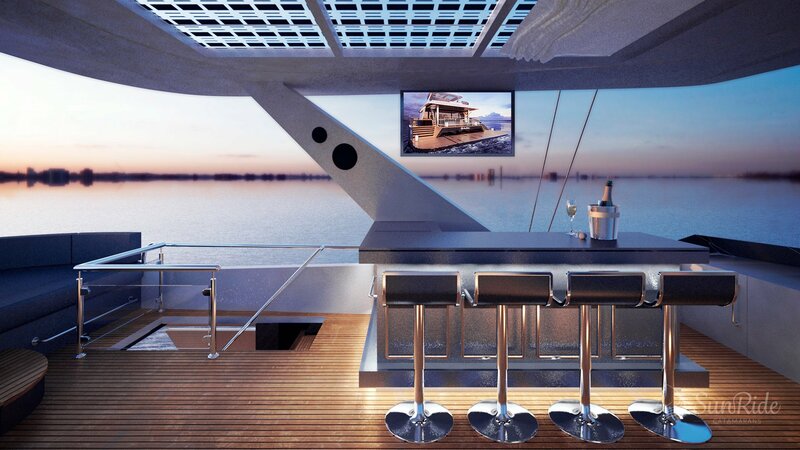 To port side of the living room we can find the main navigation post with multiple touch screens and cutting-edge technology to provide maximum security and control to the skipper. 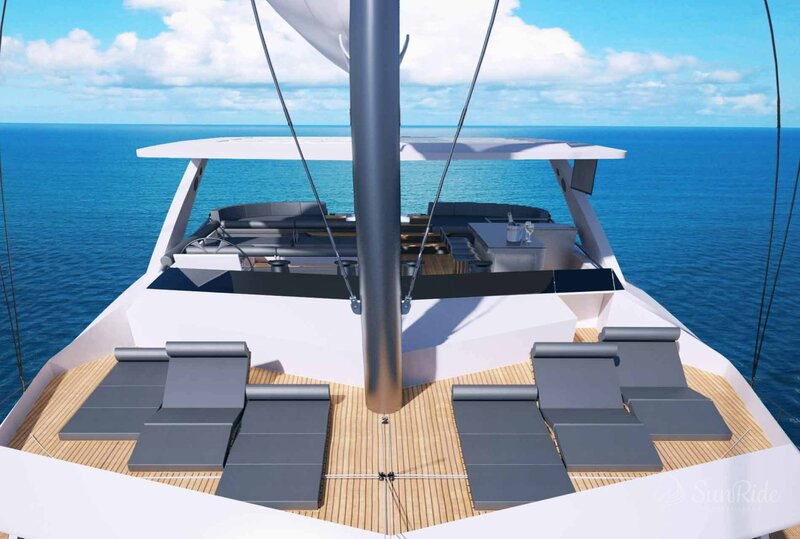 Finally, the exit on the prow side opens up to an outside outstanding terrace being the promise of incomparable sunrises. 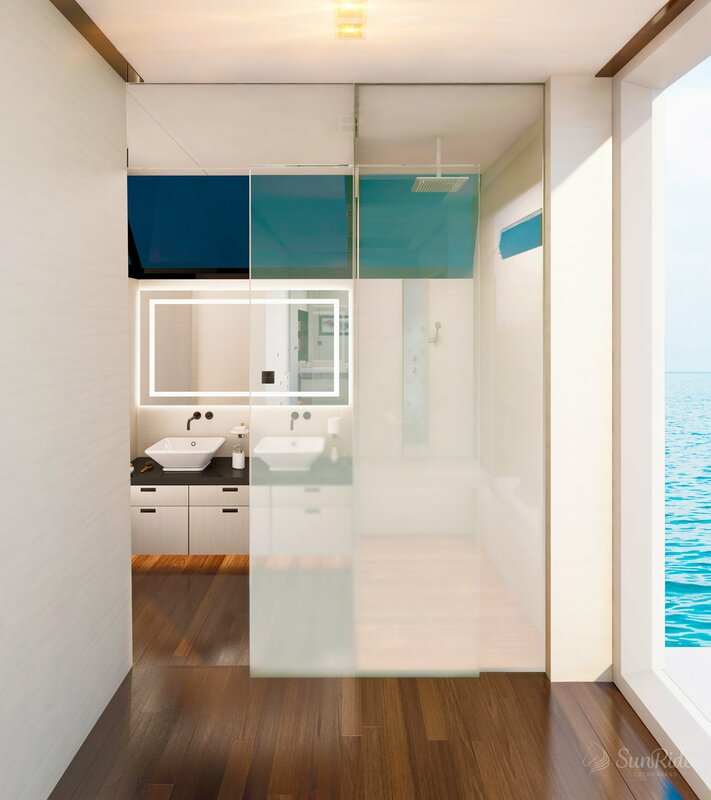 The exclusive and customizable design of the Sixty6 model’s luxury cabins-suites brings out a feeling of spaciousness, comfort and well-being. 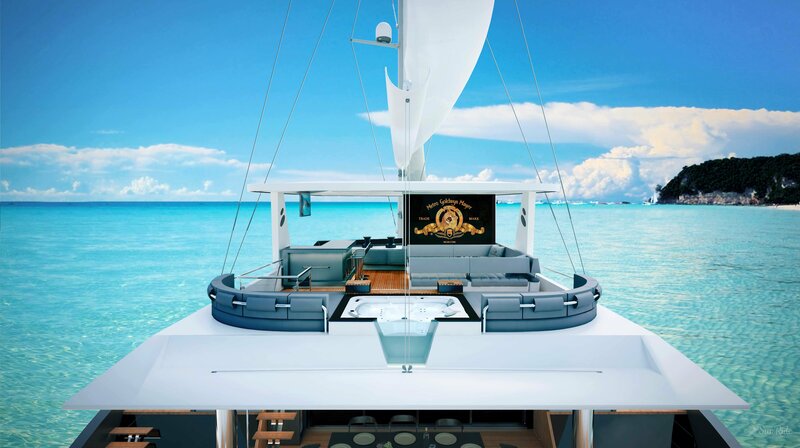 With a free height of over 2,40 meters and an unequalled cabin width, relaxing is guaranteed. 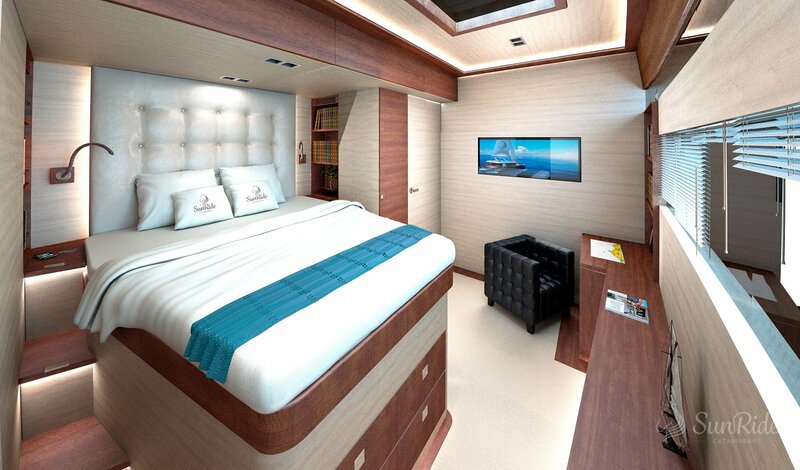 Its big double beds and infinity of shelves, cupboards and drawers offer an extra storage capacity for your long cruises. 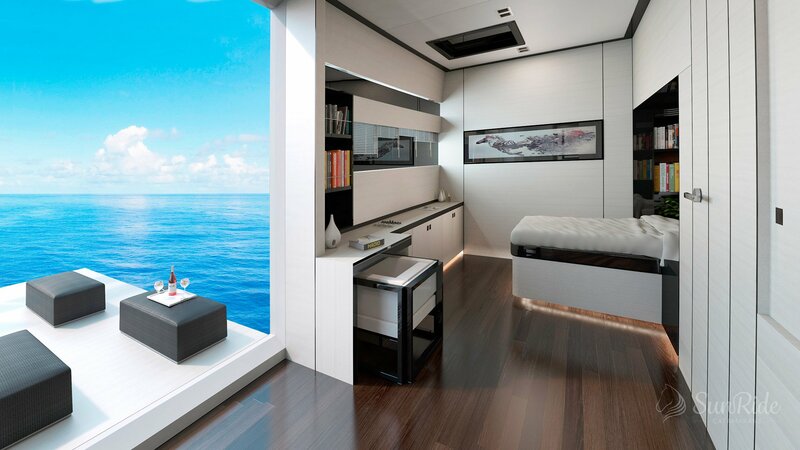 In the 4 cabins setting, 2 of them are ship-owner’s and have multi-relax space with its 3 available settings: a double chaise longue where you can relax while enjoying the view out the window, that can turn into a bed for two kids if you wish to have them in your own cabin-suite; or substitute it by a double relax armchair with a center table; or rather turn this space into a private terrace opened to the outside and exclusive for the suite. 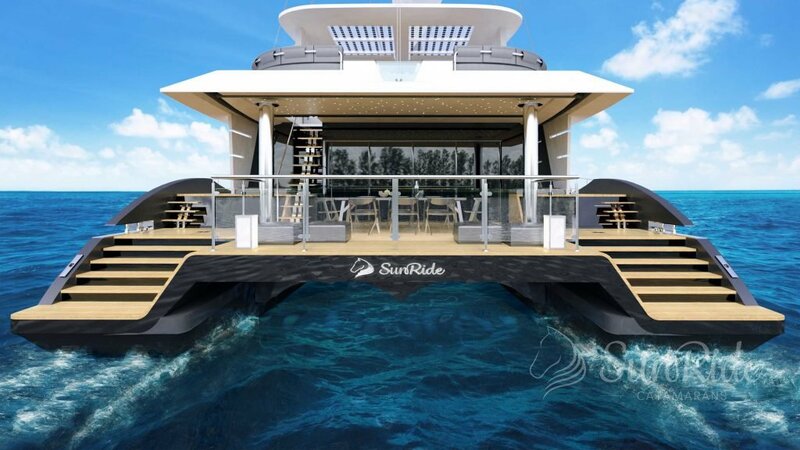 Depending on the use you want to give it, it can be set up from 2 ship-owner large cabins suites to 6 double cabins suites, and in any case with two independent double cabins for the crew. 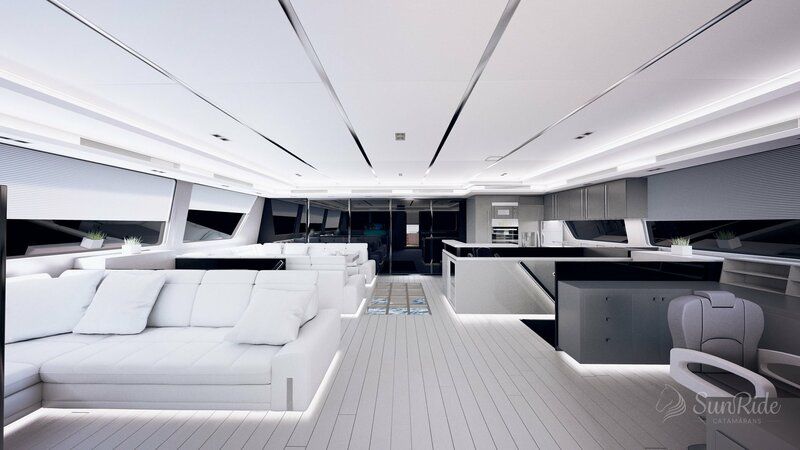 All the SIXTY6 finishes have been well thought to the last detail. 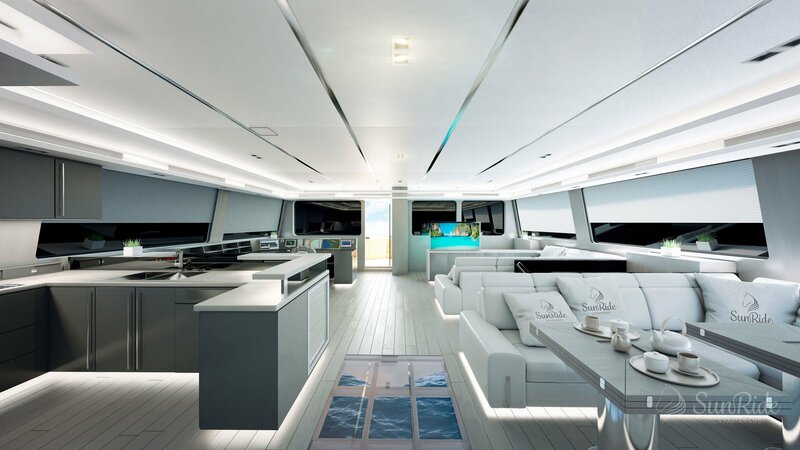 Its design both inside and outside has been precisely studied to provide the maximum comfort and space use, and also provide a unique user experience. All of it with premium quality finishes designed to provide the highest functionality, style up the lines and enable maximum savings in operative costs. 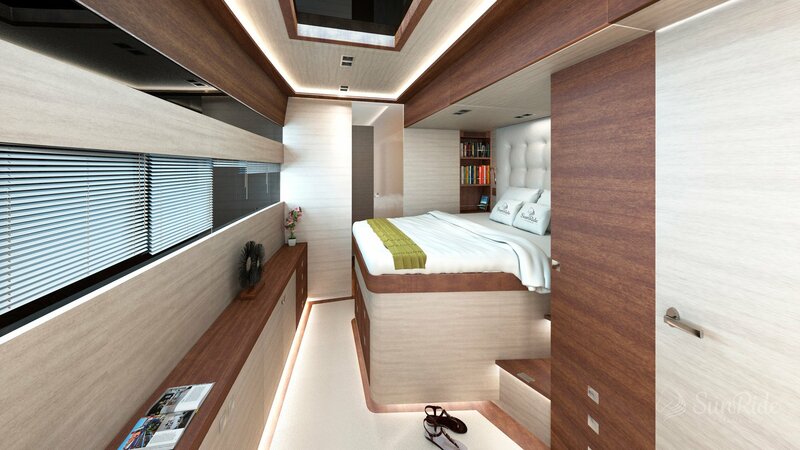 And much more of what you could find in an over 24 meters length yacht but on an only 19,99 meters’ model. 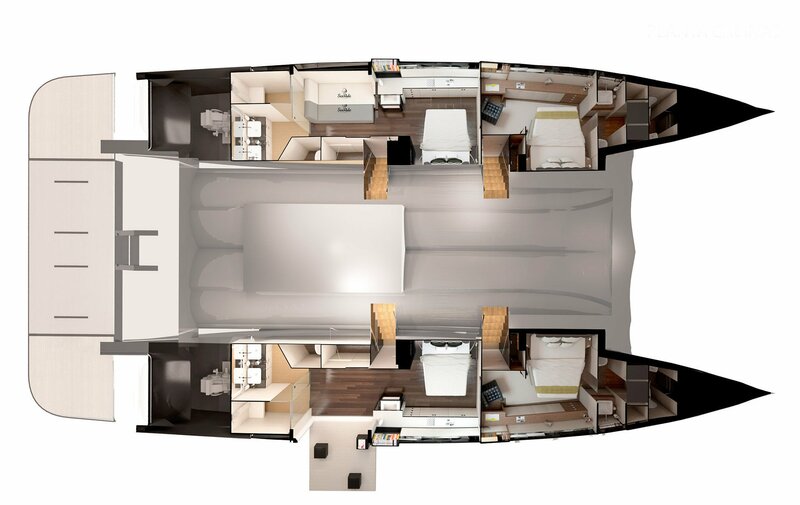 Let yourself get seduced by class, elegance and comfort aboard the new SIXTY6.